Miniature dollhouse food - strawberry short cake handmade with air dry clay in 1/12 dollhouse miniature scale. This reminds me of a home recipe strawberry short cake. Nothing really fancy, but just 2 layers of cake, fresh cream, and wholesome strawberries. Looks extremely fresh and delicious. Diameter of the cake is approximately 2cm. Height of the cake is about 1cm. Glass cake stand and cloth doily is included in the purchase. Cake and doily is not glued to the stand, so you can use them in whichever way you wish. This is a highly versatile piece. 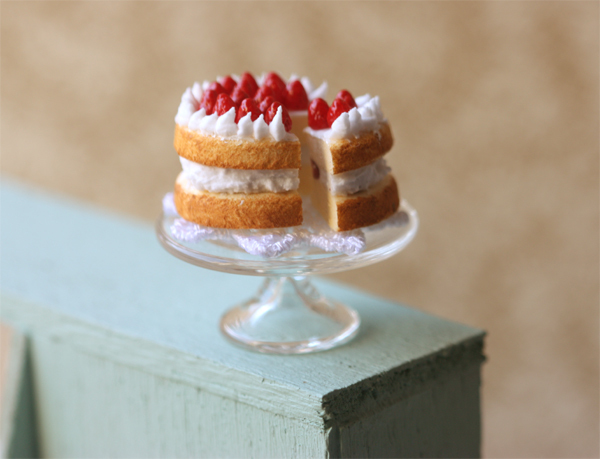 Showcase it as a whole strawberry shortcake by placing it on the glass cake stand, or you can remove the cut portion and put it on a plate. You can also display it on the dollhouse kitchen counter or on a patisserie cake display shelf (like in my photos).